The Microsoft Surface Pro was release February 9th and the 128GB version sold out almost instantly. Microsoft confirmed that the 128GB version is out of stock at Microsoft (both popup stores and online), BestBuy, and Staples but 64GB versions are still available along with all of the accessories that are available for the Surface. I wouldn't suggest buying the 64GB version unless you purchase a 64GB MicroSDXC card and use cloud services like DropBox, Google Drive, SkyDrive, and Box to store most of your files. Of course this is both good and bad news depending on how you look at it. Those that are fans of Microsoft think its a indicator that the Surface Pro is well received by consumers and the device will sell well once it gets back in stock. Apple fanboys are saying that it sold out because not many devices were available for sale anyway. A pretty convincing story can be told by both sides if you use the techniques learned in "How to lie with Statistics". 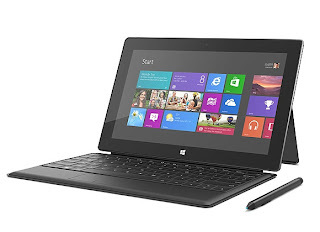 The truth is that no one can really say how the Surface Pro will sell until it's on the market for a few months. The shortage of 128GB models may truly be the result of production issues like with the Nexus 4, or it may be released in limited quantities like Apple does so often. Limiting the amount of available units has plenty of advantages in the tech world. It gives the allure of a hot selling device, gives your product a reason to stay relevant in tech news, and it causes impulse purchases when consumers do see the product for sale. Imagine a consumer who is on the fence about buying the Surface Pro. Not having the 128GB version in stock could cause them to just buy the 64GB version because it's the only one available thereby increasing sales of the version that is not as desireable. Or if they are determined to get a 128GB version, the first time they see one in stock, they will instantly purchase it because who knows when they will get another opportunity. Apple does this all the time while claiming to "ramp up production to meet demand". It's a proven sale method that almost always provides inflated results. If you want to read both sides of the argument from an Apple and Microsoft opinionated blogs, click the source links below.